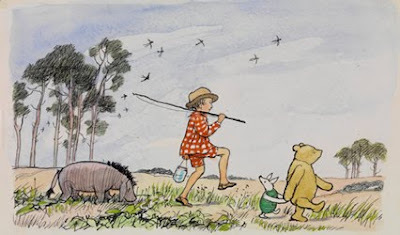 Please Come Flying: Eric Carle Museum: Winnie the Pooh! If you are anywhere in the New England area, I feel obligated to inform you that there are only THREE weeks left to catch the Eric Carle Museum's current exhibition The World of Pooh: Selections from the Penguin Young Readers Group Collection. Selections from E. H. Shepard's original drawings of Winnie the Pooh and friends will be on display until November 8th. Of course, I've put this off until the last minute, but Kevin and I are going to head down at the end of the month, with just days to spare. I can't wait! The Eric Carle Museum looks forward to your visit! We have three beautiful galleries and you will enjoy the Pooh exhibit. Our art studio also has programming around the exhibits where you can create your own Hundred Acre Wood map - or create something from the Undersea world of Eric Carle! In addition we have a wonderful Picture Book Theatre puppet and dance show coming up in November! Thanks for the info, Sandy. We're coming next week and we can't wait!